A little unusual, however with attractive foliage and flowers, Ajania pacifica commonly called ‘Pacific Chrysanthemum’ or ‘Silver And Gold Chrysanthemum’ are an Autumn flower perennial that add great colour to the autumn garden. 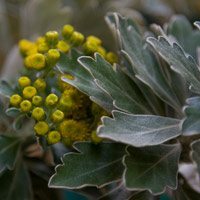 An attractive low growing shrub Ajania pacifica ‘Pacific Chrysanthemum’ is well suited to growing in the perennial border and is drought tolerant once established. The foliage lasts well year round and the flowers appear in masses. Although sold as a mound forming plant, a little pruning will be needed to keep it neat and tidy. Ajania pacifica is a low-mound forming perennial plant from from Russia and Japan. Growing to .5m with grey green scalloped felt-like leaves with a silver underside with clusters of yellow button-like flower heads in autumn. Ajania pacifica are a reasonably hardy plants and adaptable plant that will cope with full sun to part shade. A well drained humus rich moist soil is best. Plants are best kept at around 40cm in height and left to spread to around .8m. Keep growth compact by pruning or pinching back new growth early in spring to summer. Suited to growing in containers. Propagation from cuttings taken in spring to summer is easy.